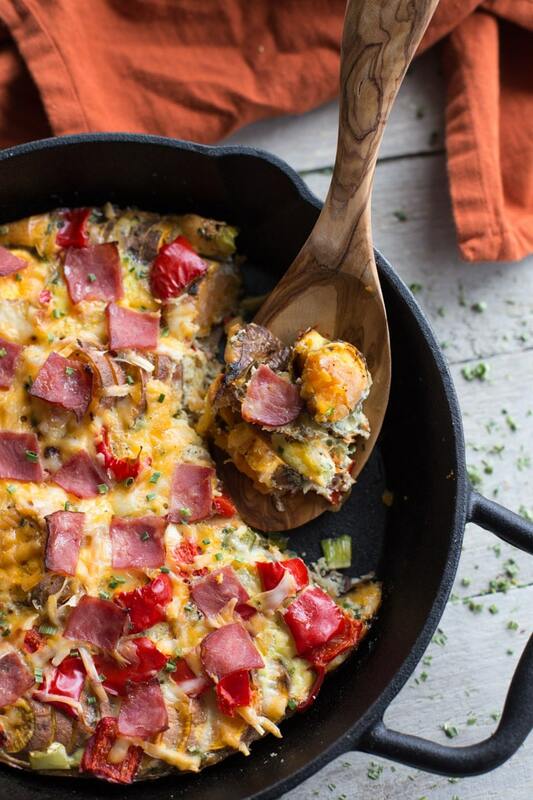 Serving up my new favourite brunch dish today – Savoury Sweet Potato Breakfast Skillet! I know I’ve said this before, but breakfast is absolutely my favourite meal of the day! And breakfast for supper?! Well, that’s just pure genius! 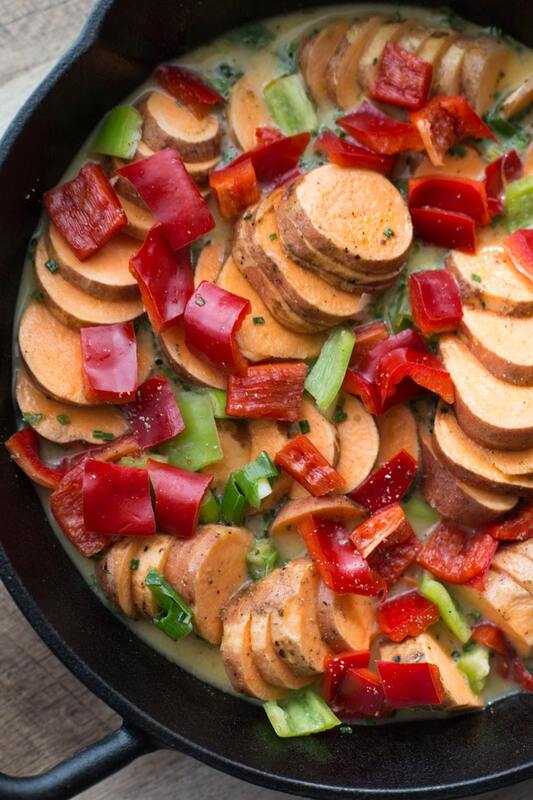 And this Savoury Sweet Potato Breakfast Skillet? It’s breakfast, lunch or supper. Whatever you need it to be! I’m a sweet or savoury kind of person. It just depends on what I’m craving when I crawl out of bed in the morning. And yes, I’m one of those people who gets out of bed ready to dive into breakfast! Sometimes I crave a breakfast that’s on the sweeter side, like granola or oatmeal breakfast cookies, and other times, I want a big, messy egg sandwich! Lately, I’ve definitely been on a savoury kick with breakfast. So when I had a bag of mini sweet potatoes to use up and lots of eggs reaching their best before date, I knew a Savoury Sweet Potato Breakfast Skillet was in my future. And it turned out so well that I’m sharing it with you guys today! This is not a complicated or fancy recipe, which, in my opinion, is what makes it the perfect brunch dish. 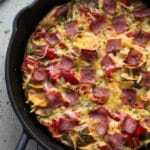 It just has four basic ingredients – sweet potatoes, peppers, eggs and turkey bacon. And, then, of course, because I love spicy, garlicky, oniony goodness, I added banana pepper, crushed chipotle pepper, garlic powder, green onion and chives. 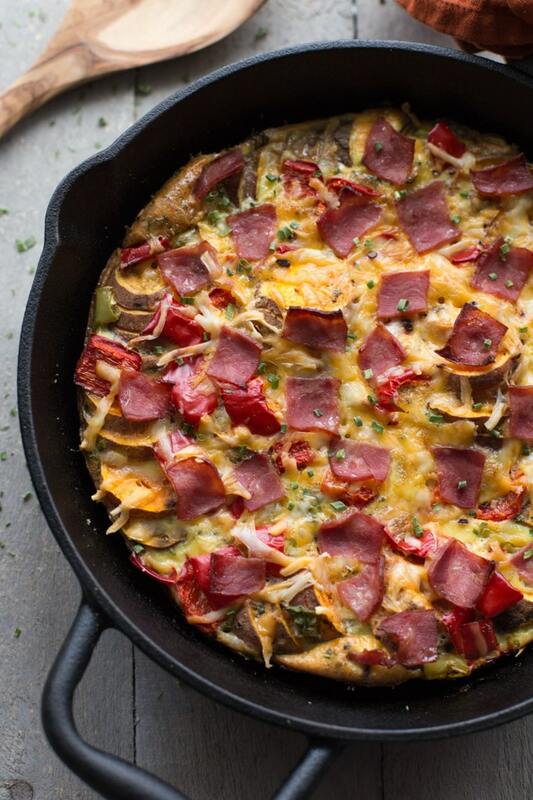 But don’t worry, this Savoury Sweet Potato Breakfast Skillet is not a spicy dish. None of the flavours are overwhelming, but they combine to create a subtle savoury taste. And this works really well with the smokey flavour of the turkey bacon. So my favourite part about this skillet is the sweet potato. Perhaps that’s obvious, since it’s a sweet potato skillet, but I thought I would put it out there! And the reason they’re my favourite part is because of the mini sweet potatoes I used, which have a thin skin that doesn’t require peeling. This is awesome because I truly dislike peeling and chopping sweet potatoes. These mini potatoes were pretty easy to work with. I had to scrub them clean, but because of their small size they were way easier to slice. Leaving the skin on also adds a nice texture, and it seemed to help keep the potatoes from getting too mushy. If you’re planning to host a brunch this fall or during the holidays, this Savoury Sweet Potato Breakfast Skillet is the perfect brunch dish. It’s super filling and helps you get your fix of protein, fibre and veggies! If you try this recipe, now or during the holidays, be sure to let me know what you think! 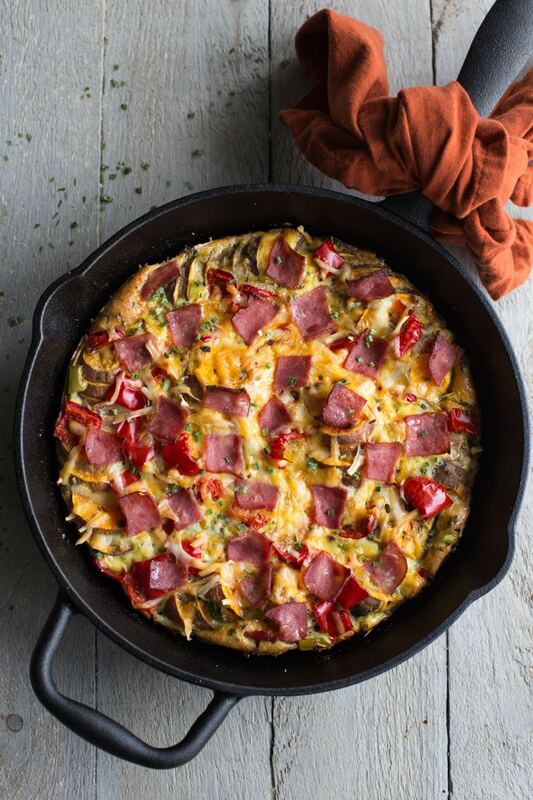 Sweet potatoes, red peppers, eggs and turkey bacon all come together in this savoury breakfast skillet. 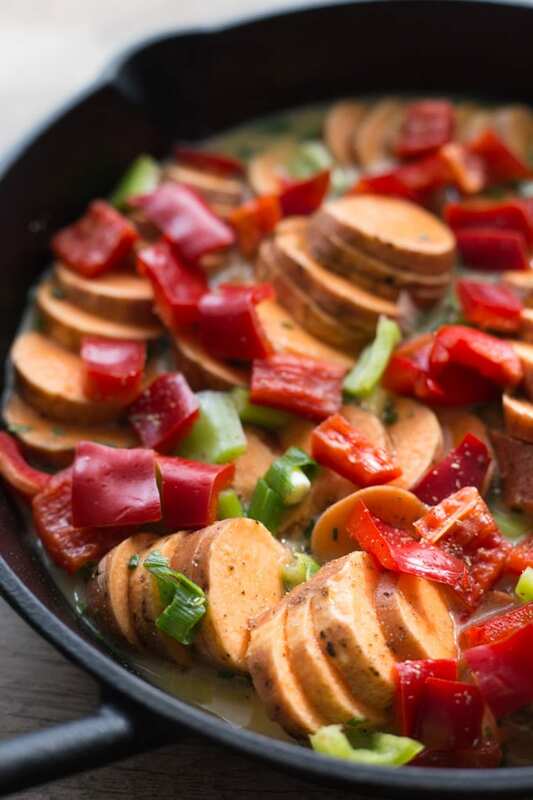 Ready in an hour, you could meal prep this Savoury Sweet Potato Breakfast Skillet for any meal of the day! Pre-heat the oven to 350 degrees and grease a cast iron pan with olive oil. Place the sweet potatoes, red pepper and banana pepper in the pan and sprinkle with 1/4 tsp of garlic powder, 1/4 tsp salt and the pepper. In a medium-sized bowl, whisk together the eggs with the green onion, chives, chipotle peppers, and the remaining garlic and salt. Pour the egg mixture over the sweet potatoes and peppers. Sprinkle on the cheese and then place the chopped turkey or ham pieces on top of the cheese. Bake for 40 – 45 minutes, or until the sweet potatoes are tender. The mini sweet potatoes are President’s Choice brand, which I found at a local grocery store. If you can’t find mini sweet potatoes, you can use full size sweet potatoes, but you will only need 2 or 3 depending on their size. You will also need to peel them and you may need to cut them into smaller slices. I used a 10″ cast iron pan, but you could use a larger pan or a casserole dish. Just note that you may need to adjust the cooking time. If you want a completely clean eating dish, you could substitute goat cheese or parmesan cheese for the marble or tex mex. And while this recipe calls for lean turkey bacon or ham, it is processed, so you could aways substitute real chicken or turkey, if you wanted to be purely clean. Thanks Elizabeth! 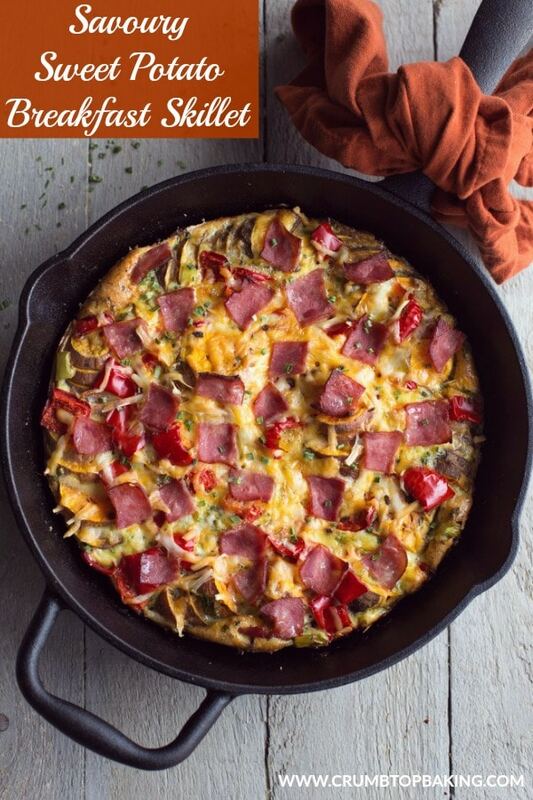 This skillet is pretty good for supper too! I may have had a big plate of it last night :). If you make it, let me know what you think!! Thanks Dawn. This is definitely a hearty recipe! And I totally agree. Skillets are awesome! This looks absolutely delicious Leanne! And during the fall I always seem to gravitate to sweet potatoes. Can’t wait to try! Thanks Mary Ann! I tend to eat a lot more sweet potato in the fall too! Must be all the cozy, comfort food you can make with them! 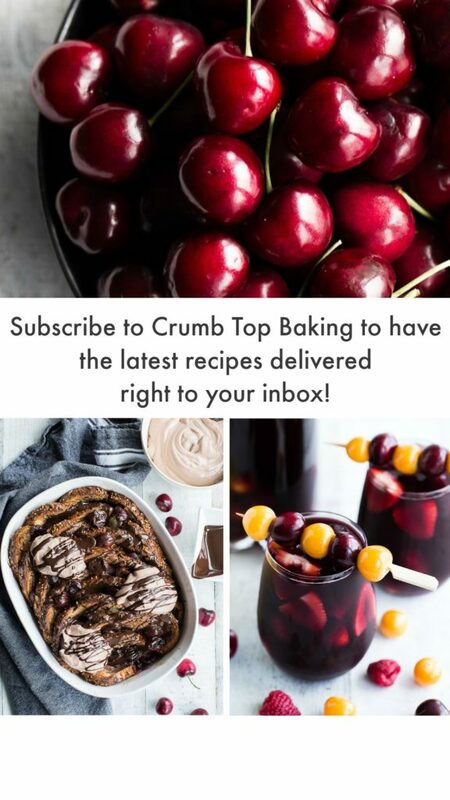 If you try the recipe, please let me know what you think! I love, LOVE breakfast too!! I will actually get excited before I go to bed, thinking of my breakfast possibilities. I’m with you, I love to change it up with a sweeter breakfast one day and a big eggy mess the next! This skillet is 100% something that my husband and I would love!! We’ll have to try it very soon!! I totally think about my breakfast options before I go to bed too!! Endless possibilities!! Let me know if you give this one a try!! This looks like weekend breakfast perfection! Yum! Thanks Vanessa! 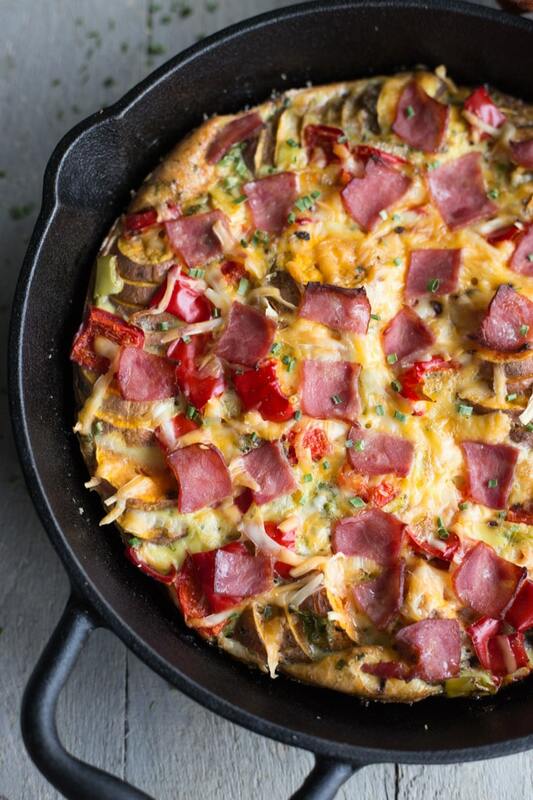 This skillet is definitely great for a weekend breakfast! This is calling my savory breakfast loving heart! I would love to have this for brunch. Thanks Meg! It’s been calling my name for every meal! I can’t wait to make it for some holiday brunch gatherings, but for now, it’s been making frequent appearances at lunch with a side salad!